La Bulle is a feel good venue, ideal for meetings, seminars and other corporate events. It is the type of place where positive vibes rebound all day, where participants are happy to work in an atmosphere that promotes innovative thinking, the exploration of new ideas and a different way of seeing things. Every detail has been carefully conceived to ensure conviviality and enjoyment. Designed to inspire and motivate, to offer calm and conviviality, La Bulle feel good venue allows you to switch off from daily routines and to fully tune in to yourself, your work partners, the job at hand and the values of your company. The experience starts as soon as you enter La Bulle… but continues once you leave thanks to all the new ideas gained and practices learned that you can apply at home or at the office! A revitalising and constructive interlude away from the office, an insight into new working methods. Louise is our communications genius, she whirls and twirls her magic to ensure that La Bulle sparkles on the Web. Please don’t hesitate to give her the thumbs up on our Facebook, Twitter, Linkedin and Instagram pages! With her innate sense of hospitality, Claire welcomes everyone with a smile. Her mission is to ensure that you enjoy your time at La Bulle to the full. Her secret weapon? Her kind, welcoming approach that you will appreciate during mental training sessions and generally throughout your stay at La Bulle. Throughout my career, I have been asked by my clients to find original, unique spaces to host seminars, meetings and team-building sessions. It was therefore a natural progression to design my own space dedicated to the pursuit of creativity. Thanks to progress in the field of neurosciences, we know today that the quality of the working environment, the excellence of amenities and the possibility to alter body posture all play a role in keeping our minds alert. Writing on walls, moving around, playing, laughing or just moving seats are all proven techniques for enhancing awareness and intellectual stimulation. 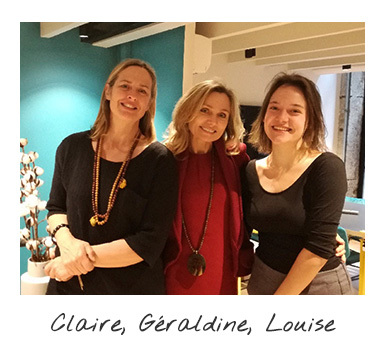 My aim at La Bulle is to promote the idea of well-being for more successful meetings through the use of simple exercises that enhance concentration levels and enable participants to feel fully revitalised. Moreover, the effects of a successful event do not necessarily stop when people leave La Bulle as each and every participant can use the techniques learned to optimize their work-life balance. For 17 years Géraldine directed Peillon et Associés, a communications agency in Lyon and in 2010 she founded and still heads up Chantiers de la Com, an agency specialised in print, digital and communications projects.